This is the needle-felted piece I've been working on. Inspired by a call for art at the resident's gallery in the Franklin Arts Center where I work. The theme is work that is exactly 12" x 12", and since mine is not an exacting nature, I had to ponder how I might be able to fit that requirement. It wasn't until I started poking at some wool that I decided that I wanted to do a piece reflecting a portion of the landscape in my mind. Like a quadrat, a tool scientists use to isolate a standard unit for study. Though this scene is plucked from my imagination, it definitely has its roots in reality. For example, my fungus here is influenced by the orange peel fungus by the duck pond in my backyard. A sprouting plant with downy leaves is similar to the mullein by the driveway. Waxed thread becomes my take on sporophytes that dot our back woods. Pebbles and sprouting grasses atop mounds of moss and earth. And pebbles, plucked from lakeshores, naturally. This was a really satisfying piece to work on, especially since it allowed me to conjure up images of greenness in this otherwise winter-white landscape. Almost done with my new piece! If the light cooperates I should have photos to share tomorrow. I spent the better part of yesterday needling away at some wool. Forming stones and coaxing curly locks into moss. I had the music on and my littlest needle-felting companion with me, needling on her own creation while the cat sat in a wood bowl and watched us. Even though we clearly bored him. Today I'll add some other shapes and hopefully a few sewn accents. It's a fun piece to work on. When I make my mushroom terrariums, I always take special joy in adding all of the details to the scene so this is allowing me all of that fun on a larger scale. But speaking of scale, check out the mini scene my little partner created. Momma is proud. Late summer at dusk. The mosquitos have gone to bed and the fireflies hang in the trees like christmas lights. Our ice cubes clink in our glasses as we sip on the last of the homemade kahlua and listen to the owls call to each other from the tall pines in the back woods. We sit and chat about how the garden is coming along nicely, about how nice the day out on the lake had been. We hear the guineas settle into the branches of the poplar. The last sparks of the campfire lift lazily into the sky. Our sandals dangle from our feet. We start to think maybe we'll go throw a sweatshirt on over our t-shirts. We catch the faintest whiff of impending autumn in the air. And we feel content. I'm not the kind of person that wants to live her life only looking forward to the next thing. I'd like to embrace the present. But I gotta tell ya, this snow-up-to-my-thigh and "today's high will be -10" is gettin' old. So if pretending that I'm holding a chilled kahlua instead of a hot coffee is going to get me though this day, that's what I'm going with. I hope you're in a good place today, no matter where that is. Come join me for a kahlua. It's been a while since I've done more "traditional" stitching. There's something really soothing about the repetition of the blanket stitch through felted wool. You just kind of get in the rhythm and your hands are doing their thing and then suddenly you're looking down at a finished piece and wondering how on earth that happened. It's good to change things up every now and then, isn't it? These are headed off to somewhere special. More to come, soon. I hope you all have a stellar Wednesday. Go shake things up. little stitchy 'bobs are here! The other day I gave you a little peek at the Kit Lane pieces I collaborated on. Well here they are! They look a little shocked at what has happened to them, don't they? but you can also see some other pics on her flickr page. Hope you all have a great start to your week. I finished up my last little Art-o-mat stone yesterday morning (yay!) and I'll be boxing them and sending them off on Monday. Hopefully they'll turn up in a machine near those of you that have been asking, soon. Today I start a new journey, on a different path than the one I started in November. One that leads me in an exciting new direction. Starting today yours truly is the Executive/Artistic Director of The Crossing Arts Alliance, a non-profit in my town that promotes the arts and artists in our area. You may remember me mentioning before how much I've enjoyed volunteering there. To be able to turn this love of volunteering into a paid position...I don't even have the words to express how happy I am. While I'll still be working outside of the home, and away from what I've built here, I get to work at something I'm passionate about...the arts. The icing on the cake is that the hours I'll work will provide a better work/life balance than the position I've recently held. I'm a lucky girl. I'm flying high today, much like the fun frisbee I found in my mailbox (my kids have delighted in flinging my likeness around, by the way). If you're curious about The Crossing, please take a moment to check out their website or come visit their facebook page (I'll be showing up there regularly). If you're in the area, please stop in and see me in the office adjacent to the Sales Gallery at the Franklin Arts Center in Brainerd, MN. I look forward to seeing all of you here more regularly too. "Do we have to go out there? It's so cold." Words I mutter almost daily lately. But yes, little 'bobs, we must. 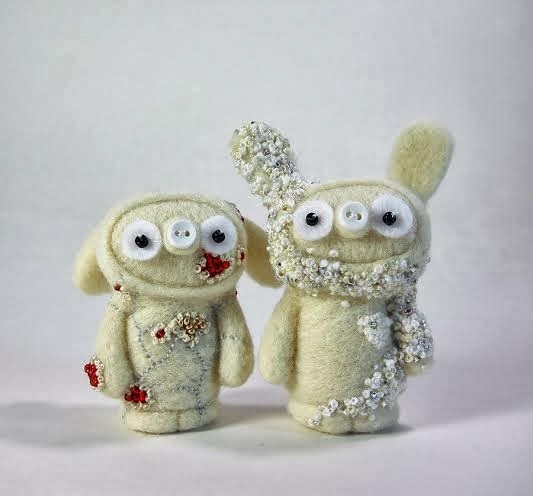 These two are headed back to their talented creator, Kit Lane, after being visited by my sewing needles for a spell. They'll show up in her shop soon, I'm sure. One of them has a delightful little secret that I can't share yet, but it makes me giggle when I think of it. Hope you're having a warm weekend.